Getting the oars setup today. They are just a cheap, sporting goods store set of Caviness oars. I think I paid 15 bucks apiece for them in the off season a couple years ago. They have some damage from using them without leatherwork, but that’s hidden under the leather now. My stitching is not as good as some I’ve seen for sure, but it’ll do for now. Maybe if I build a nice set I’ll step it up on the fancy stitching for that pair. 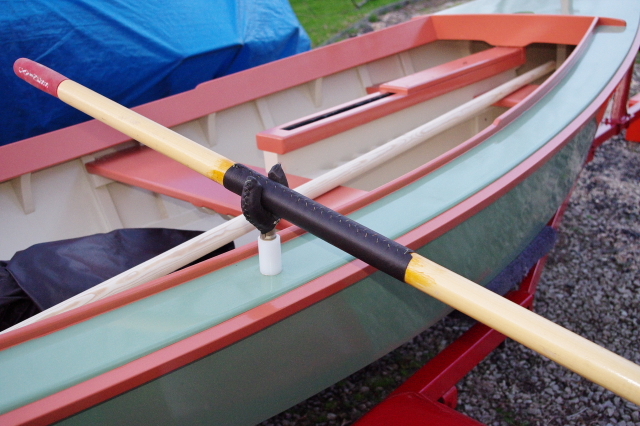 We’ll see – I plan on sailing more than rowing – but if she rows nice, maybe I’ll want nicer oars. The opening in the horns was too large so I padded it out with rubber from a bungee strap, seized it with sinew, and leathered over it, It looks good to me – I’ll have to see how it works in practice. 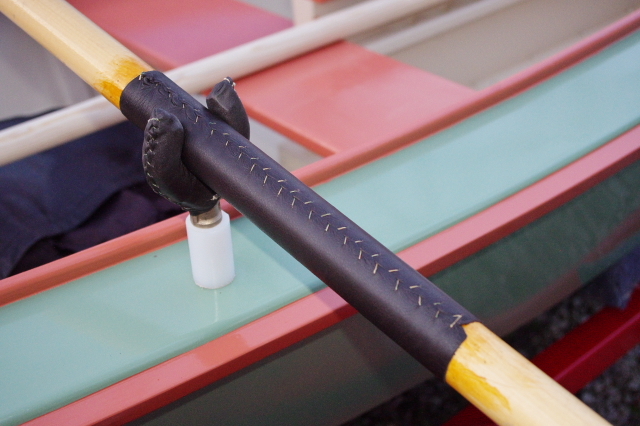 This entry was posted in Sharpie build and tagged boat building, leather, leatherwork, oarlocks, oars, sailboat, sharpie sailboat, wooden boats. Bookmark the permalink.